In a vast cosmic experiment equivalent to hitting "redial," astronomers in a dozen countries are aiming telescopes to listen in once again on some of the stars that were part of the world's first search for alien life 50 years ago. Lanxon writes "The Global Seed Vault opened in 2008 after engineers spent a year drilling and blasting through the sandstone, siltstone and claystone of the Norwegian Platåberget Mountain to create a system of subterranean chambers on the Advent Fjord's southern flank that could store 4.5 million seeds. It's a $9 million bet against climate change. But can it save us from the threat of worldwide famine? An article at Wired explores its current state and its future: '... it operates as a secure storage space for samples of other collections that are at risk. The samples remain at all times the property of the depositors, the only proviso being that the originals must be freely available to researchers and breeders under the terms of the International Treaty on Plant Genetic Resources. There have been deposits from every continent: 3,710 species in total, from 29 crop institutes representing 226 countries. Over the past few years the need for a secure storage facility has become ever more urgent. A typhoon in the Philippines in 2006 caused a flood that left the national crop gene bank under two meters of water.'" Butterflies sorta creep me out. First, they start out as another bug and then they cocoon themselves. Who does that? And just take a look at this butterfly egg, it's borderline alien looking. Lyric Semiconductor has unveiled a “probability processor” computer chip that performs calculations using probabilities, instead of binary logic. It could accelerate everything from online banking systems to the flash memory in smart phones and other gadgets. The science fiction of melding man and machine has played out for decades onscreen, from The Six Million Dollar Man to The Terminator. But the bionic hybrid age may well be flickering to life – real life – in the Calgary lab where scientists who made history fusing snail brain cells to a computer microchip six years ago are poised to try the same feat with human cells. Researchers at the University of Calgary’s Hotchkiss Brain Institute are to announce Tuesday that they have made a key advance in connecting brain cells to a newly designed silicon chip, crafted with the National Research Council of Canada, that allows them to “hear” the conversation between living tissue and an electronic device as never before. Dubbed Blue Brain, the simulation shows some strange behavior. The artificial “cells” respond to stimuli and suddenly pulse and flash in spooky unison, a pattern that isn’t programmed but emerges spontaneously. The Washington Post takes a look at an upcoming Star Wars-themed toy that uses new technology to allow the user to levitate an object...with their mind. 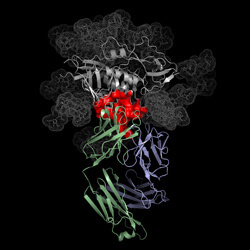 Antibody VRC01 is pictured in blue and green, binding to the HIV virus, shown in grey and red. Will HIV eventually go the way of smallpox and polio? Earlier this month, scientists at the National Institute of Health (NIH) announced their discovery of three new HIV antibodies, the most powerful of which neutralizes 91% of all HIV strains. These are the strongest antibodies yet found, and they could hold the key to developing a vaccine to AIDS. 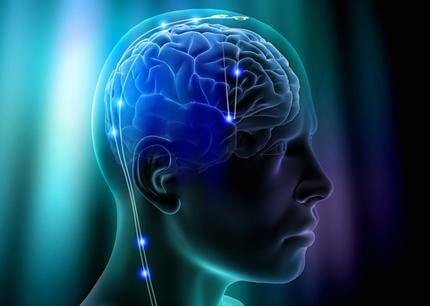 An international team of researchers led by Dr. Matti Mintz at the University of Tel Aviv is working on a biomimetic computer chip for brain stimulation that is programmable, responsive to neural activity, and capable of bridging broken connections in the brain. Called the Rehabilitation Nano Chip, or ReNaChip, the device could be used to replace diseased or damaged brain tissue, restore brain functions lost to aging, and even treat epilepsy. 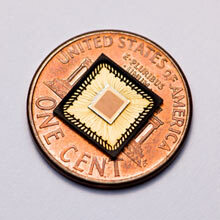 The chip is currently in animal testing, but should reach human applications within a few years. Pentagon-backed scientists are getting ready to test thought-controlled prosthetic arms on human subjects, by rewiring their brains to fully integrate the artificial limbs. Already in recent years, we've seen very lifelike artificial arms, monkeys nibbling bananas with mind-controlled robotic limbs, and even humans whose muscle fibers have been wired to prosthetic devices. But this is the first time that human brains will be opened up, implanted with a neural interface, and then used to operate an artificial limb. In the midst of the data and gadget revolutions, a new, crossbreed movement is emerging: around-the-clock health information tracking devices. With healthcare growing more and more expensive, people are turning to alternative ways to take care of themselves and monitor their health. And with nifty little gadgets getting less expensive and more sophisticated by the day, health information tracking devices are part of the key to answering our healthcare needs. We seem to be moving towards something dubbed Body 2.0: the “networked” body, the new wave of constantly tracked, databased health information.